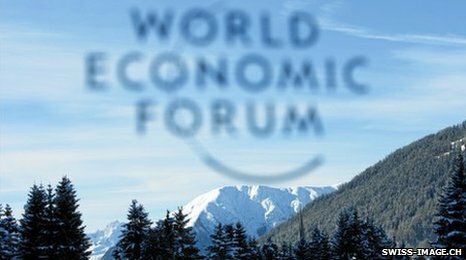 Prime ministers, presidents and leaders of the world's biggest companies are in the Swiss ski resort of Davos for the third day of the annual World Economic Forum. The issues they will be debating affect millions of us. The BBC will be bringing you minute-by-minute coverage, analysis from our team of correspondents, and your reactions. 1840: And that is where we leave it for today. The focus moves East at Davos tomorrow, with an early session on China's image abroad, before Japanese PM Naoto Kan makes the big speech of the day. Barclays' Bob Diamond will be discussing the global economic outlook. Join us for live updates throughout the day from 0800 GMT. Thanks for visiting and feel free to send us your comments. 1818: On the sidelines of the forum, Germany's Angela Merkel said she has appealed to Egypt to allow peaceful protests, saying that stability was not worth sacrificing freedom. "The freedom of opinion has to have a chance. There is no point in corraling and imprisoning people, to curb the possibilities of information. We need a peaceful dialogue in Egypt. The stability of the country is of utmost importance, but not for the price of the freedom of opinion." It comes after days of demonstrations in Egypt against the rule of President Hosni Mubarak. 1752: At the Harvard Business Review , Justin Fox writes: So you write an article about how capitalism needs to be rethought along principles of what you call "shared value," a prominent business publication puts it on its cover, and then you show up at perhaps the world's foremost gathering of capitalists to find everyone (well, maybe not everyone, but lots of people) talking about it. Cause for celebration, no? Well, if you're Michael Porter it isn't quite enough: I ran into him yesterday here at Davos and the first thing he said was something along the lines of, "You need more copies of HBR here." Fair enough. 1748: Which Davos party to go to tonight? Henry Blodget, CEO of Business Insider, writes about his experiences of the less serious side of Davos: the parties. 1733: David Cameron urges all countries to tell their trade negotiators "not to hold back" so that a deal can be done this year. 1732: Chairman of Goldman Sachs International Peter Sutherland is talking about the importance of concluding the Doha trade talks - already 10 years old. He is calling for a deadline of December this year - if they are not concluded this year they will run on "for some time to come" as we will get into electoral cycles, particularly in the US, he says. 1728: The debates keep coming. Currently on stage, in the last big economic session of the day, are David Cameron, Angela Merkel, the WTO's Pascal Lamy, and Peter Sutherland from Goldman Sachs International. 1717: Ms Suu Kyi asked the audience to invest in her impoverished country. "We yearn to be a part of the global community," she said. "We have already missed so many opportunities because of political conflicts in our country over the last 50 years," she said. But invest carefully, she says. Read her message in full. 1710: Surprise audio address by Nobel laureate and Burmese political activist Aung San Suu Kyi has just begun. 1709: Is this the beginning of the end of dollar hegemony? Davos has reignited the debate, with many saying they believe a more pluralistic currency system is the future. US dollar's role as a reserve currency is likely to diminish as Asian economies like China grow and countries seek to diversify their monetary holdings, some say. In a panel session earlier, Bank of Israel Governor Stanley Fischer said he was "more optimistic about the euro gaining strength as a potential reserve currency". "We ourselves are diversifying into currencies which we would never have put in the reserves before, including the Australian dollar and so forth," he added. And others agreed. Turkish Finance Minister Mehmet Simsek said: "Ultimately the centre of gravity is shifting towards the East". What do you think? Send us your comments. 1655: Mrs Merkel is talking about closer political and economic integration as the key to future stability. The current heterogenity of rules and regulations across the eurozone, such as different retirement ages, can't continue she says. 1653: Angela Merkel says the markets are still not convinced that countries will be able to pay back their debts after the crisis. "Indebtedness is the biggest risk to prosperity on the continent," she says. 1646: Oh ok, so the thing that was meant to be at 1715 and then was meant to be happening on Sunday, is actually happening at 1715 GMT afterall. We just like to keep you on your toes. Keep an eye out. 1642: Ever wanted to know what goes on on the fringes of the World Economic Forum? Tanya Beckett takes you on a tour and shares some tips on networking. 1636: Seen in Davos conference centre: Cherie Blair and David Cameron in conversation. What about? @r4today, tweets the BBC's Justin Webb. 1633: Next up on the main stage, German Chancellor Angela Merkel, in a session entitled Addressing Global and European Challenges. 1628: Apparently the thing that was going to happen at 1715 GMT (1815 Davos time) is not going to happen until Sunday, according to the BBC's Tim Weber. 1621: I just cooked for Bill Gates and Bill Clinton at the world economic forum in Davos then had the pleasure to meet them!!!!!!! Wow, tweets Thomas Sellers. 1620: What are we reporters doing in Davos? We should be in Egypt! Anybody know if visas still being issued for journalists?, tweets journalist Nick Kristof. 1615: There's a round of applause as David Cameron says the UK will double its funding for polio vaccinations to try to eradicate the disease - to go up from $30m to $60m but there will be strings attached. Others have to come up with new funding too. 1606 At the Harvard Business Review, Umair Haque writes: Davos loves diversity - as long as said diversity doesn't carry the terrifying prospect of actually generating perspectives that question the primacy of the obsolete, crumbling paradigm known as industrial age capitalism. But here's the thing: especially in a time when your fundamental assumptions are breaking, it's probably your fiercest critics - not your compatriots - who have the sharpest, most resonant insights. 1603: At CNN's Belief Blog, Dan Gilgoff writes: The surge in discussions around faith and morality at Davos reflects a broader resurgence in interest in business ethics since the housing and banking crises of the late 2000s, which many experts blamed largely on greed and deceptive business practices. 1600:Now this is interesting. What are the star campaigners' favourite African leaders? Meles Zenawi in Ethiopia, says Melinda Gates. Paul Kagame in Rwanda, says Bono. Think some people may be surprised by their choices. What do you think? As ever, we welcome your comments. 1550:In the current session with Melinda Gates, Bono exhorts world leaders not to cut development budgets in efforts to cut deficits. He said he had had to be critical of President Sarkozy in an article in Le Monde as he is under pressure to cut his aid spending. "But I really like him," Bono admits. Perhaps that is what he meant when he said earlier his work had made him "uncool". 1547: Meanwhile, union leaders in Britain have not ruled out co-ordinated industrial action over talks, following talks at the TUC, according to our news report here. Not great news for David Cameron, who is due to speak later in a session on global trade. He will be joined by German Chancellor Angela Merkel, WTO's Pascal Lamy and Indonesia's President Susilo Bambang Yudhoyono. 1542:And Bono has entered the discussion... Are events like Davos just talking shops, Bono asks? What happens when events like these finish? A lot, apparently. Since the Gates launched an initiative in Davos in 2004, 6,000 infant lives a day have been saved, the U2 man declares. "Shout it from the rooftops." We will, Bono. 1526: What happens in the first month of life is key, Melinda Gates says. Of those 8m deaths, 40% happen in the baby's first 28 days. Muhtar Kent from Coca-Cola says his company is working with the Gates' Foundation to raise awareness about vaccines in Africa. They are also using their supply chain expertise to help make sure the vaccines get where they need to. 1520: Melinda Gates, is speaking at the Raising Healthy Children session. She says the fact it the session is happening at Davos is "incredible". She reels off some stats: 1960 - 20m children dying. 12m by 1990. Now 8.1m. How do you help that number come down quicker? Invest in women and vaccines, she says. 1514: The glass is half full cause of huge liquidity & fiscal injections. What will fill the glass when fiscal discipline kicks in & no more QE? tweets "doctor doom", economist Nouriel Roubini. 1500: Talk of #Davos - Vodafone ordered by Mubarak to take down mobile phone network in #Egypt and complied. Voda believed it had no option, tweets Robert Peston. He also reports that Chancellor George Osborne says a lending deal with banks - what he calls a "settlement" with them - is "very much on", so long as banks offer enough. 1442: So if you had to choose between an ipad and a laptop, which one would you go for? Andy Freire is feeling distinctly outnumbered... He tweets: The ratio of ipads to laptops is 20 to 1, what I am doing with my sony vaio? tweets Andy Freire. 1438: The European Commission says that "urgent" consideration is being given to plans that could see Greece loaned new money from a eurozone bail-out fund. The spokesman for EU economic affairs commissioner Olli Rehn says such a plan is "on the table". This follows comments from French Finance Minister Christine Lagarde who said the bail-out fund could be expanded. 1425:Tim Brown, boss of consulting firm Ideos, is guest blogging for the WEF blog . He writes: "As has been the case for a few years, crowd sourcing and social media continue to dominate conversations around Davos this week. In the context of this years theme what is new is the way in which these topics are being discussed. While there is still a division between the views of those directly involved in these disruptive ideas and those used to more traditional approaches, there is evidence that the concept of bottom-up emergence and the power of the network is percolating through all sectors." 1420: Don't forget you can catch up on all of the latest in-depth news and gossip at our Davos special report page. 1356: Oh... whether you're in the #davos conference centre or outside, make sure to listen in at 1815 local time. Can't say more, but do it, tweets the BBC's Tim Weber. We know too, but can't say. We'll have full details here. 1354:Speaking of US growth... Government figures show that the US economy grew at an annualised rate of 3.2% in the last three months of 2010, compared with 2.6% in the third quarter. 1350: One of the world's most high profile business women appears on BBC World. Pepsi Co's Indra Nooyi says there is still an issue with growth rates in Western Europe and the US - "the two big developed market engines". US growth rates are looking good she says, but numbers don't tell the whole story. We have to start talking about when growth is going to start fixing the unemployment situation, she says. Without that growth will just be temporary. Meanwhile, Pepsi Co has said it has won approval to acquire a big Russian juice and dairy company, after Dmitry Medvedev's call for foreign investment during the Davos opening. The deal will turn Pepsi Co into the country's top food and drinks firm. 1340: Middle East envoy and former UK Prime Minister Tony Blair is in the quiet and peaceful resort of Davos, talking about the violent protests currently happening in Egypt. It is a fast-moving situation he says. "What I think is happening is a process of change in the Middle East and the whole region. What is important is that it happens in a way that the country where ends up in a better place and that is sometimes not as easy as it sounds." 1339: UN secretary general Ban Ki-moon has warned that the world's current economic model is an environmental "global suicide pact". "We need a revolution," he said during a Davos session. "Climate change is also showing us that the old model is more than obsolete." 1321: Tony Blair confesses that he never used a mobile phone or a computer when he was a prime minister, tweets Roxanna Samii. 1320: What would you say was the world's worst corporation? More than 50,000 voted in the annual Public Eye Awards for companies who environmental campaigners say haved acted irresponsibly. At a ceremony at a Davos hotel, the "winners" were named as Finnish biofuels maker Neste Oil and mining company AngloGold Ashanti. 1312: Meanwhile, Felix Salmon blogs at Reuters about the "most obnoxious party" at Davos: a wine tasting event by Wine Forum. "The result", he says, "was basically a drunken mess". "Revelers would cluster around stations loaded up with fine wine, getting large pours of increasingly-indistinguishable heavy cabernets, competing to find the Cheval Blanc and Le Pin (which were naturally considered the most desirable wines, just because they were the most expensive), all the while fighting off jetlag and concentrating mainly on greeting their old Davos buddies and catching up on gossip," he writes. 1256: If you missed US Treasury Secretary Timothy Geithner speaking earlier, here is a clip below or you can check out our news story. 1254: Practical or respectable? Tracy Corrigan blogs in The Wall Street Journal that, faced with the hard decision of which shoes are best for both the meeting rooms and snow in Davos, she says many executives are deserting their usual formal choice and just plumping for the hiking boots. A suit and snow boots: why not? I particularly like the boots Jeffrey Sachs is modelling. 1246: David Cameron will announce later that the UK is to double its funding for the battle against polio, garnering much praise from Bill and Melinda Gates. Melinda tells BBC World that what the UK government is doing is "amazing" and they are showing "real leadership for the world" on this issue. 1235:A bit of debate generated from Mr Cameron's speech after the contraction of the UK economy in the final quarter of last year (blamed in part on the weather). John from Durham writes: Most of Europe had the worst weather in a hundred years but they are not using it as an excuse for poor performance in their countries. Martin from Nottingham, however, argues that Labour's overspending caused the cuts. He writes: They left the country with massive debts and chose to spend money they knew UK did not have. The UK need to set a course for low tax. 1218: #Egypt: the young desperately fighting for a better future. #Davos: old rich dudes fighting savagely against it. I know who I'm with, tweets Umair Haque. 1213: Tari Eyenghe from Nigeria writes: What the world need is sincerity from world leaders and enterpreneurs, especially those from the rich economies, to assist their poor counterparts (Africa), not to promise but to put their promises to action by monitoring the funds donated, so that the common citizens in these poor countries can feel the aid to improve their economy and wellbeing because of high corruption prevalent amongst government officials. 1211: Davos moment: sitting next to CEO of @CAinc and former President of NASDAQ. Power lunch, talking about economics of cloud computing, tweets Robert Scoble. 1207: Meanwhile, OECD chief Angel Gurria says Greece could still default on its debt. 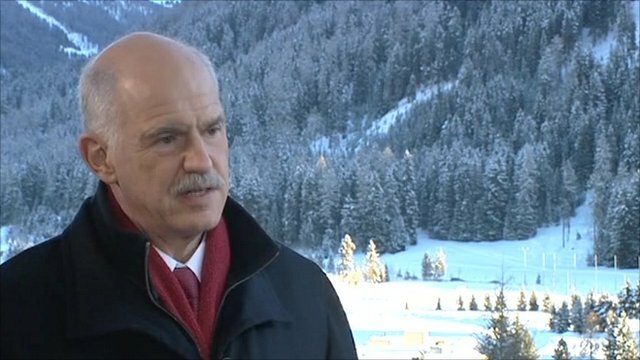 Not so, its Prime Minister George Papandreou tells BBC World. "This is out of the question." 1203: President Sarkozy came to the defence of the euro yesterday. Today is the turn of Angela Merkel, who will speak later. According to Reuters, her spokesman said she was equally resolute in her desire to defend the single currency. Germany had "the exact same view", he said. 1202: Most humans are risk-averse, but Davos Man sees the flipside of risk: a huge opportunity to make money, writes the BBC's Tim Weber, as he assesses the view from Davos on which investments are hot, and which are not. 1200: While Chinese have huge powerful position with #wef, Japanese delegation actually larger. But it's all India this year, tweets Nancy Lublin. 1154: Is Russia faring better than the US? Timothy from Salisbury writes: What strikes me about Davos is that the Russians have a much better grip on reality than the USA. I am not a left-winger, but it seems to me that the Americans have lost the economic plot. 1152: "We are working on making the EFSF more efficient, more flexible, and if it needs to be bigger for that matter, so be it," says French Finance Minister Christine Lagarde. The question is, just how much bigger will it need to be? 1122: Fate of the EFSF: Debate has turned to the European fund used to help rescue the Irish economy last year, the European Financial Stability Find (EFSF). The EFSF was established last June to help heavily-indebted eurozone members after Greece had to seek help to avoid a default. Now, eurozone leaders are looking at ways to boost the fund. The BBC's Europe business correspondent Nigel Cassidy says: "There is growing optimism in the corridors of the World Economic Forum in Davos that a permanent eurozone rescue deal is taking shape. It could involve an enlarged European Financial Stability Fund spending some of its cash to buy back Greek bonds. Attention may focus later today on expected speeches from German and Greek politicians." 1118: Just tuning in now? For those of you who missed it, here is a short clip of David Cameron's Davos speech, where he talks about staying the course and reiterates his commitment to spending cuts. (If you can't see it, please refresh your page). 1101: Geithner admits the housing finance business in the US (that's the mortgage industry to you and me) is still "a mess". 1100: But that's perhaps all he's picking up from Cameron. Making deep cuts in spending, Geithner says, "is not the responsible way" to bring down state deficits. 1052: Is Mr Cameron's confidence catching? Now Tim Geithner says confidence in the US is growing now that there's a "sustainable expansion" in the economy. But he's not getting too carried away. "It is not a boom." 1049: @davos observation: cameron's entourage moves through a crowd totally different than mr blair's. Less rushed...more of the room #UK tweets Bloomberg's Tom Keene. 1048:Cameron analysis: The British prime minister was making the case to global investors for placing their capital in Europe's liberal democracies - and warned them against betting too much on what he called the "authoritarian capitalism" of China, Russia and other fast growing emerging economies, writes Robert Peston. Some will see this as a provocative statement at an event thronged with the so-called authoritarian capitalists. Read Robert's thoughts on David Cameron's speech in full. 1046: At Polis director Charlie Beckett's blog, he writes: I am chair of the WEF council on informed societies so the workshop on Governing In The New Media Age was the perfect opportunity to put our proposals to the global experts and the people who really matter, the governments. I was surprised at the generally positive understanding that we are now living in a glass room and that transparency is what the citizen expects as the default setting for governance. There was even a general sense that Wikileaks is something to work with, not to eradicate.."
1044: Geithner: "very confident' europe can manage their problems. // how nice Timmy how about OUR PROBLEMS? ?, tweets Rachel Wells. 1043: According to Charlie Rose (who's interviewing Tim Geithner), David Cameron had great admiration for President Obama's State of the Union Speech and is going to tell his speechwriters to take a look at it! 1042: Geithner admits US gov part blame for crisis due to poor oversight of banks. Pity UKs gov of that period were not as frank #Davos #wef, tweets Peter Chandler. 1040: No U-turn for Mr Cameron. Read our news story on David Cameron sticking with his recovery plan. 1035: French President Nicolas Sarkozy said in a speech yesterday that he would not let the euro fail and he had confidence in the currency. Geithner says he shares that confidence. 1034: Bad news for Mr Cameron from a survey of British consumers. The confidence of UK consumers in the economy and their finances has suffered its biggest monthly drop in almost 20 years, a GfK NOP Social Research report suggests. No wonder he was talking so much about foreign trade. 1029: Back to US Treasury Secretary Geithner. Despite fears about rising food and commodity prices, Geithner says inflation at the global level is not at the high end of concerns. 1025: Why so little discussion of Egypt and beyond? That could be what we remember about this week 10 years from now, tweets Esther Dyson. 1023: Cameron talking about being optimistic and calling for a pan-continental drive to build entrepreneurship. Hope he can deliver, tweets Dame Wendy Hall. 1020: US Treasury Secretary Geithner is asked if the US stimulus package should have been changed or if it should have been bigger. "We did what we thought was necessary at the beginning," he says. Is that an admission that their thinking has changed now? 1020: At the FT blog , Save the Children's Jasmine Whitbread writes: The majority of entrepreneurs I talk to here have, in the last few years, grown huge global businesses usually in complicated layered relationships with other tech providers. They like it here because all the players in this web of "coopetition" are in one place, along with clients too." 1008: Cameron- finally! rebalance economy with exports and manufacturing not only City, tweets Edith Lemieux from Paris. 1007: Deficits and debt will continue to be the big issue with the next big speaker, US Treasury Secretary Timothy Geithner. The US is one of the few developed countries who expect their deficit to grow, rather than shrink, this year. He is up in the main hall shortly. 1007: Mr Cameron's address was very pro-business. He spoke about deregulation and making sure Europe is the centre of innovation. He was suggesting that the British government had been careful to prioritise growth in their cuts. "Some people sitting in Britain will take issue with some of the things he said," commented the BBC's Stephanie Flanders. 1001: Medvedev used an i-Pad for his speech, but looks like Cameron took a different approach: No iPad in sight, just the old paper technology, tweets new media strategist Vesna Gerintes. 0956: The PM wraps up his rallying speech saying "Europe has to earn its way. The world doesn't owe us a living." Clearly Mr Cameron rejects the theory that slow growth for Europe is inevitable. He's struck an optimistic tone and done his best to try to instil confidence in Europe. Will it work? Let us know what you made of it. 0951: Cameron talking about being optimistic and calling for a pan-continental drive to build entrepreneurship. Hope he can deliver, tweets Dame Wendy Hall. 0945: Cameron: Our biggest ambition should be for innovation. "Above all what we urgently need in Europe is an aggressive, pan-continental drive to unleash enterprise." 0944: Clearly, the "spectre of massive sovereign debts" is not only exercising David Cameron. The IMF was involved in the bail-outs of Greece and the Republic of Ireland, and its deputy MD says he thinks the euro will survive the debt crisis. "The political will and the economic possibility is there to make sure the euro survives and it survives intact," John Lipsky says. 0942: Cameron: This year's bank stress tests must be tougher. 0940: We must stick to the course, says Cameron. 0940: Unlike his Chancellor, George Osborne, who lay most of the blame for the UK's shrinking economy on the bad weather at the end of last year, Mr Cameron says the weather was only part of the story. 0938: Europe's first priority must be to kill off the spectre of massive sovereign debts, David Cameron says. 0937: Cameron says "noone is immune" from financial crisis. Says "disappointing" figures brought home what his party had been saying for months: that "recovery was going to be choppy". 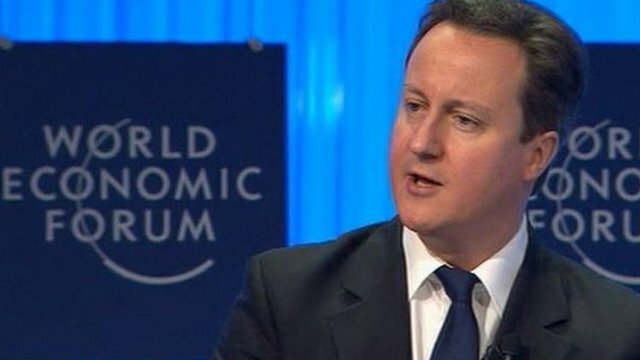 0935: British PM David Cameron takes to the stage to give his special address to the WEF. 0928: At the official World Economic Forum blog , The Nature Conservancy president Mark Tercek writes: "Businesses increasingly understand that their success depends on these natural resources. They are beginning to think of these resources as "natural capital," critical to their bottom line. These business leaders see the threats that lie ahead and they are acting now -- rather than waiting for government intervention and regulation. They are also beginning to partner with NGOs like The Nature Conservancy and others to develop innovative solutions that are good for both business and nature." 0921: We will be streaming British Prime Minister David Cameron's speech here LIVE from 0930 GMT, so don't go anywhere. 0915: Do we need to rewire people to want less, the sustainable development panel are asked. Do we need to tell the guy in India with two candles to use one? That is not a solution - nor will it happen, says Bill Gates. We want people to live better lives, to have the entertainments and freedoms that people in developed countries enjoy, you just have to make sure that the energy you use is clean. 0906: This year on climate change in America, "One party mocked it, the other party ran from it." Thomas Friedman tweets entrepreneur Bill Gross. 0903: Due to be ending now is a session on extreme leadership and lessons in risk-taking. Alison Levine, an elite explorer who has climbed the highest peak on each continent and skiied to the North and South Poles, definitely sounds equipped to talk about the subject! Ms Levine has been sharing her risk-taking experiences with delegates, and explaining how lessons from Mount Everest can translate into the business world. I'm sure she can give them a few tips on the ski slopes too. 0900: Indonesia's President Susilo Bambang Yudhoyono, who said yesterday that scarce resources could lead to "economic war" in future, says the whole idea of sustainable development needs redefining for countries like his. You can't have it without stronger economic growth, he says. That must be how they are going to pay for the billion trees they plan to plant this year. 0848: It's been a turbulent few months at the top of computer giant Hewlett-Packard. The firm's previous chief executive was forced to resign following rumours of sexual harrassment and an expenses scandal. And new boss Leo Apotheker has replaced a third of the board. But is Mr Apotheker the man to make HP "cool"? Read our interview with Leo Apotheker here. 0839: Interesting to see the boss of Wal-Mart, Mike Duke, on the sustainable development panel. His company is bigger than many economies. He says they are working on making their shops more energy efficient and working on a "sustainability product index" so that customers can understand "the footprint" of the things they are buying. Crucially, he believes they can make these changes and keep shareholders happy at the same time. 0837: When Google announced last week that Eric Schmidt would be standing down as chief executive, many thought the internet giant had become rather too grown up and was looking to regain its youth. "You will not be surprised to hear that Mr Schmidt rejected this criticism - and most of the others that I threw at him," writes the BBC's Stephanie Flanders. Read our news article on Google here. 0828: Martin Stock from Vancouver writes: The real agenda of Davos is to give blanket support to the commodification of all that exists - air, water, DNA, and to give credence to the absurd notion that the economy is the fundamental of civilisation. While we may publicly decry the brutalities of various regimes we say little or nothing of the corporations that take advantage of their brutality and effectively fund their existence. 0824: Look out for UK Prime Minister David Cameron's special address at 0930 GMT. Despite figures earlier this week showing the economy surprisingly shrank by 0.5% in the final quarter of last year, the PM is expected to say the economy is making "progress". However, the Financial Times says his speech will strike a "sombre" tone compared to a rather more upbeat note before Christmas - in realisation of the challenge ahead. More on this later. 0818: A round of applause for Finnish President Tarja Halonen when she says one of the key answers to sustainable development is making sure women have a more equal role. 0814: In a #davos session on "hyperconnectivity" ... can we turn the firehose of data into information?, tweets the BBC's Tim Weber. 0813: Davos is kicking off with a session entitled Redefining Sustainable Development. How we manage increasingly scarce resources will be a key issue, UN secretary general Ban Ki-Moon says in his opening address. Bill Gates is also on the panel. 0810: Takalign Birhanu from Ethiopia writes: Africa should be heard because she can contribute more in the economic development of the world if the developed nations are wiling to assist self designed economic policy of African states like Ethiopia, Africa can bring a change in the economy of the world! 0807: At a very early breakfast meeting in #davos. We are greeted with the words "in Davos, sleep deprivation is a state of mind", tweets the BBC website's business editor, Tim Weber. 0802: Welcome back to the BBC's live coverage of the world's most exclusive networking event at the Swiss mountain village of Davos. We will be updating this page throughout the day, bringing you insights from BBC correspondents, some of your emails, tweets (hashtag: #davos), and the best of the blogs. If you missed yesterday's coverage, you can catch up here.